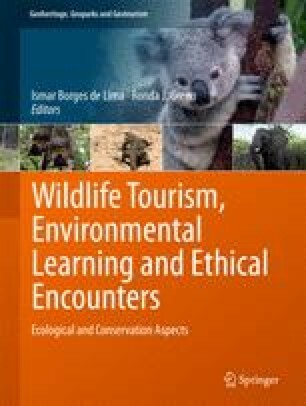 Previous studies on the conventional form of wildlife tourism have limited the discussion on wildlife management to the context in which wild animals are regarded exclusively as ecologically significant beings. With ever-increasing tourism development around the world, wildlife tourism takes place in a wide range of forms and settings beyond their natural environment. In many Asian countries, where certain species of animals have a long history of close associations with humans, the animals are often found in human modified environments. Thus, their cultural significance is expected to play an important role in management decision-making process. In this chapter, we shift our attention to wild animals whose habitats extensively overlap with human modified space using two case studies from Nara Park and Miyajima Island in Japan. Wild sika deer (Cervus nippon) found in these sites are well-adapted to the human modified environment and have close interactions with humans. A rapid growth in tourism at these locations in modernity created the challenge of managing the deer that hold ecological and cultural values simultaneously. We review the history of deer at each site, their management practices, and challenges that they face. While both Nara and Miyajima deer are considered wild, they are managed in dissimilar manner. We argue that understanding the context of wildlife tourism and the history of the human and animal relationship is a necessary component of more sustainable wildlife management for tourism. We sincerely thank all individuals who made our work possible. Special acknowledgement is made to Taoyaka Program Scholarship at Hiroshima University for the financial support throughout my academic career. We would also like to extend our acknowledgement to Dr. Ismar Borges de Lima and Dr. Ronda J. Green for giving us the opportunity to contribute to this book.